All the way from Bath, Maine! I took my husband for his birthday weekend. 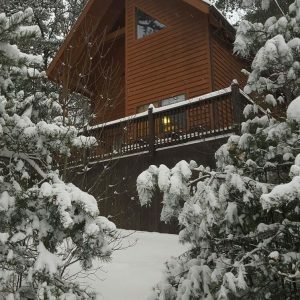 Jill’s cabins are beautiful!! Very clean and so cozy. The private hot tub is amazing!! The air was crisp and surroundings were so peaceful. If we needed to contact Jill during our stay, she answered right away. She is very pleasant and so helpful. The views along the parkway are breathtaking. Her directions were very clear and easy to understand and follow. The “to-do” suggestions were very helpful. We went to lunch at the Mountain View Restaurant, visited the AtlaPass Apple Orchard and we went horseback riding through the river and mountain trails. We also went to the Biltmore Estate. We were only there for 2 nights, but soaked up as much as we could while we were there. We saved the Biltmore Estates for day of check out, because we wanted to thoroughly enjoy the cabin. We do plan to be back again!! We truly enjoyed our time at Jill’s Cabin.